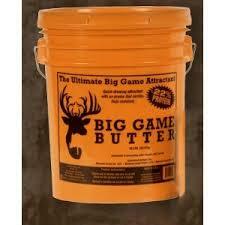 Big Game Butter is a peanut based, wild game attractant sure to get the deer headed your way. This 22% protein, 44% fat attractant is excellent supplemental nutrition. Deer are naturally attracted to the smell and taste of this mix. They are sure to return for seconds of this tasty attractant. No mixing necessary with this attractant, just put the pail where you want and prepare to see some deer. See a hunter’s footage below using this product. Stop by Lochte Feed to pick up yours today. This entry was posted on Saturday, July 15th, 2017 at 3:14 pm	and is filed under News & Updates. You can follow any responses to this entry through the RSS 2.0 feed. Both comments and pings are currently closed.